Project Scope: The primary goal of this research is to understand and determine the value of HAR and CBRAS Technologies. Addressing this goal will aid the FTE’s and the DOT’s management in determining how to proceed or not proceed with the use of these technologies. If either of HAR or CBRAS technologies is determined ineffective, the outcome of this research can ultimately provide recommendation(s) to either abandon one or both of these technologies, and/or determine what alternative ATIS technologies are viable candidates for replacement(s). In contrast, if either of these technologies is determined to be significant benefit, this proposed research will examine the option to maintain one or both technologies, as they currently exist. Project Scope: This research provides awareness of the potential benefits, detailed elements and influence of the Transportation Systems Management and Operations (TSM&O) throughout the project development process. The Primer will provide highly detailed guidance on the impacts of TSM&O for all disciplines or units within State, regional and local agencies (i.e. planning, traffic operations, design, maintenance, construction, etc.). TSM&O is traditionally managed by traffic engineers to focus on the optimization of efficiency and operations within a particular corridor utilizing common techniques such as re-timings and access modifications. With the emphasis moving towards maximizing current infrastructure, the Department envisions that the practice of managing TSM&O can be applied to all units for increasing efficiency. Therefore, the Primer study would provide the detailed guidance for how the project development would be handled from the initial stages in planning through traffic operations to the final construction of the project. The main project objectives are to expand the database and increase the number of intersections to 50 intersections, refine the DSS model developed in Phase I and validate it using the expanded database, modify the coded version of the DSS model to reflect the results of the new database, virtual testing of the DSS through VISSIM API interface with the controller, and field testing through pilot study. Project scope: The objective of this Major Research Initiative (MRI) is to develop innovative programs to monitor, assess, and improve safety using Big Data. The MRI will provide a framework and a roadmap that can be used to plan, design, operate, and maintain data intensive safety systems, i.e., systems that can enhance safety by using historical and real-time data from several sources. By developing knowledge, tools, and products based on Big Data, the MRI will contribute to potential improvements in safety. The MRI focuses on safety data from a diverse set of sources that include video, loop detectors, Bluetooth devices, GPS devices, social media, and weather (RWIS), merged with conventional data sources such as roadway parameters, roadside elements, land use, and planning data. Project scope: This proposed Major Research Initiative (MRI) will focus on the use of both traffic simulation models and driving simulators to better understand causes of traffic crashes and test and assess selected countermeasures to enhance the safety of the public. One of the main efforts for this MRI is to develop crash prediction models based on simulated traffic conditions utilizing vehicular conflicts. The three areas proposed for this initiative include motorists’ crashes with other motorists, pedestrian and bicycle safety, and management of large-scale emergency situations. Project Scope: The proposed research has two-fold: (1) A development tool that would assist governmental agencies in the prioritization of sidewalk gaps or bicycle-lane gaps based on a balanced approach between safety needs, operational constraints and fiscal assessment (potentially including quantity of incidents reported, qualifying incident reports, reason for incident, cost of sidewalk, regional location of supporting land uses, bus stop locations, and areas of concern for Americans with Disability Act (ADA compliance). (2) The development of a statewide average for pedestrian crash rates that would give transportation planners and engineers a barometer indicating how the regions (or Districts) compare against other areas, thus evaluating locations that are operating beyond statewide averages and therefore emphasizing mitigation improvements. Project Scope: In Phase I of the project, we extended the screening procedure in Part B of the Highway Safety Manual from microscopic to macroscopic safety analysis. Our novel integrated screening method overcame the shortcomings of current macro- and micro-level approaches and provided a comprehensive perspective on appropriate safety treatments by balancing the accuracy and efficiency of screening in Phase I. However, Phase I research illustrated that there are five main issues that need to be addressed before finalizing this work. This second phase addresses these 5 issues. Project Scope: The Highway Safety Manual (HSM) Part D provides a comprehensive list of the effects of safety treatments (countermeasures). These effects are quantified by Crash Modification Factors (CMF) which are based on compilation from past studies of the effects of various safety treatments. The HSM Part D provides CMFs for treatments applied to roadway segments (e.g., roadside elements, alignment, signs, rumble strips, etc. ), intersections (e.g., control), interchanges, special facilities (e.g., Highway-rail crossings), and road networks. Thus, an assessment of the applicability of the HSM in Florida is essential. 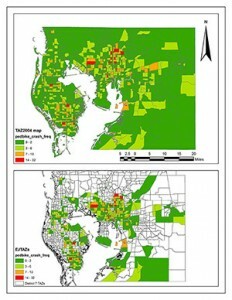 The objectives of the first phase of this study was 1) to develop CMFs for various treatments in Florida for the same setting (rural/urban), road type, crash type, and severity level in the HSM, 2) to evaluate the difference between these Florida-specific CMFs and the CMFs in the HSM, and 3) to recommend whether the CMFs in the HSM can be applied to Florida or new Florida-specific CMFs are needed. Project Scope: Evaluating the Wrong-Way Driving Incidents Problem on the Florida’s Turnpike Enterprise Roadway System. Project Scope:The main goal of this proposal is to develop and recommend appropriate countermeasures to combat wrong-way driving incidents on the OOCEA’s toll road network. Project Scope: Determining Hot Spot Locations Of Wrong-Way Driving Incidents On Florida’s Turnpike, Phase-1 Study. Project Scope: Utilize Human Centered Simulation to address the safety issues prioritized by the US DOT. Transportation safety rests on the interaction between the roadway, the vehicle, and the driver. Simulation offers a powerful tool to address how drivers interact with roadway design and operations features as well as how they interact with vehicle safety systems. Our research, technology transfer, and educational efforts will be directed toward using driving simulation to study road user behavior and to perform roadway engineering safety evaluations. Each of the consortium members is home to one or more interactive driving simulators used by faculty, students, and staff from civil engineering, industrial and systems engineering, psychology, and computer science. Our work also expands driving simulation toward integration with microscopic traffic simulation and 3D roadway design tools. The use of visualization in transportation planning and public outreach is another area where simulation is growing in importance as a tool to put users on new road before they are built. Our research will address all road users including passenger car drivers, transit users, pedestrians, bicyclists, and heavy truck drivers. Project Scope: This proposal is submitted for the UTC consortium (NCTSPM) of which UCF is a member. The program requires non Federal matching which we have based on the recently awarded relevant FDOT project. This research moves visibility systems from detection only to combining it with prediction. This project will validate an alternative and much more cost-effective approach that provides early detection of the onset of fog. Since the coverage of scatter sensors can be limited and need to be repeated every certain spacing, we intend to also investigate other advanced detection methodologies such as camera based detectors. We also intend to develop strategies to mitigate the negative effects of reduced visibility, e.g., Variable Speed limits (VSL) and DMS messages. Thus we intend to study the effect of reduced visibility due to fog/smoke on traffic flow characteristics. Data from Radar, loop and AVI detectors will be used to study flow parameters in reduced visibility. Crash analysis and patterns under low visibility conditioned will be studied. Equally important is investigating the human factors aspects by understanding drivers behavior, reactions and preferences when encountering reduced visibility and when provided guidance by VSL and DMS. We intend to conduct driving simulation experiments and in depth interviews of subjects. Project Scope: The University of Tennessee-Knoxville (UT) has assembled and is leading an experienced and talented consortium of universities in the southeast to compete for the Region 4 USDOT Regional University Transportation Center which, if selected, will be funded at $2.75M. Our Consortium members are: The University of Tennessee (Lead) University of Kentucky North Carolina A&T State University University of North Carolina – Chapel Hill Clemson University The University of Alabama The University of Alabama at Birmingham University of Central Florida University of South Florida UT meets and exceeds the eligibility requirements to be the lead institution of this consortium, and has proven over the past 18 years that it can effectively and efficiently oversee a successful Regional UTC. In addition, all of our consortium members are fully qualified academic institutions, each bringing specialized resources and capabilities to enhance the overall consortium. For this new proposal, STC will continue with our primary theme of comprehensive transportation safety, which is particularly relevant to the Southeast Region that we represent. This primary theme directly supports the Secretary’s Strategic Goal of the same title. Going forward, the STC will build on our successful history to further address the regional, national, and global transportation needs as described in the USDOT’s Strategic Goals. Project Scope: The objectives of this research are to develop: 1. Crash severity and crash type SPFs or distributions or both that can be used in the estimation of the crash type and crash severity likely on the facility types contained or intended for use in the HSM; 2. Recommendations of how the research results can be incorporated into the HSM and associated tools, including the development of associated chapters or chapter content in AASHTO standard format for the HSM second edition and recommended procedures for consistent use of crash severity and crash type SPFs or distributions or both; and 3. A description of the statistical and practical advantages and disadvantages of the methodology developed in the research and potential barriers to implementation. Project Scope: The objective of this research would be to reach specific conclusions about how to implement the HSM Part D in Florida. Massive data collection of safety data will be needed. Data for before and after treatments will be collected and crash modification factors calculated and compared to the HSM, and CMF values validated or re-calibrated. Project Scope: This research would provide more efficient approach to identifying high-risk locations in the district or state, and therefore the ability to direct resources to safety treatments more effectively, with a clear impact on safety. It also combines the important issue of transportation safety planning and conscious planning with network screening methods developed in the HSM Part B. In addition to Florida DOT’s Safety office, Systems planning and Environmental Management offices would have a stake in this research. All district planning, MPOs and counties would use the two levels screening results developed in this project. Extensive literature review using TRIS and other sources shows a gap in the already developed safety planning (TSP) models. In addition there is a shortcoming in some aspects such as Pedestrian safety for example, which is a key in Florida, Georgia and Alabama, among other states. Also safety in Environmental Justice areas is not addressed. In addition, the HSM has been published for less than a year, so research pertaining to Part B is still in its infancy. To our knowledge this two-level approach of integrating TSP and HSM Part B has not been addressed in any study. Project Scope: The collection of reliable Origin/Destination data for freight has profound consequences for a large range of applications in both planning and operations. Indeed, in both research and practice, a large number of applications rely heavily on such data. The challenge over the years has been the tremendous expense in both time and cost related to the collection of such data. This is true for both regular and freight traffic where O/D data collection relied heavily either on manual counts and interviews, or on expensive ITS technologies that required excessive MOT and lane stoppages for installation. In an exploratory project which was funded by the Florida Department of Transportation (and recently completed), the principal investigator and his research team developed a novel approach for tracking trucks using their license plate numbers. In that project, the researchers selected two gantries on Hwy 528 near Orlando, FL. Both gantries were fitted with cameras aimed at capturing truck license plates. That project which was completed recently clearly demonstrated the feasibility of the approach however more work needs to be done before a system can be adopted for wide application. The remaining challenges are the following: 1. Due to the lack of available 110V power, the system could only be tested for a few hours at a time. For the same reason, very limited amount of data was collected. 2. Most freeway gantries do not have available power. The ones that do may have “switched” systems that only operate at night. Most of those do not run on 110V requiring costly transformers. Also wiring each gantry for 110V power is relatively expensive. 3. Power consumption of cameras was not a design issue as the assumption was that power is readily available and cameras require relatively low wattage. 4. The system used an expensive triggering device. Due to cost considerations, a single trigger was used for all lanes. This means that only one lane can be triggered at any given time. While this worked fine for Phase I, clearly this approach is limited in busy corridors where multiple trucks can be using several lanes simultaneously. 5. Relatively long time needed for system installation as wiring the system was time-consuming. In the proposed project, we propose to address these limitations and expand the field test to three gantries covering a total of 9 lanes (Gantry locations will be selected in consultation with FDOT). Data will be collected for a full year to account for seasonal changes, which will enable the research team to fully evaluate the approach on a large data set. Due to the lack of available 110V power, the system could only be tested for a few hours at a time. For the same reason, very limited amount of data was collected. Most freeway gantries do not have available power. The ones that do may have “switched” systems that only operate at night. Most of those do not run on 110V requiring costly transformers. Also wiring each gantry for 110V power is relatively expensive. Power consumption of cameras was not a design issue as the assumption was that power is readily available and cameras require relatively low wattage. The system used an expensive triggering device. Due to cost considerations, a single trigger was used for all lanes. This means that only one lane can be triggered at any given time. While this worked fine for Phase I, clearly this approach is limited in busy corridors where multiple trucks can be using several lanes simultaneously. Relatively long time needed for system installation as wiring the system was time-consuming. In the proposed project, we propose to address these limitations and expand the field test to three gantries covering a total of 9 lanes (Gantry locations will be selected in consultation with FDOT). Data will be collected for a full year to account for seasonal changes, which will enable the research team to fully evaluate the approach on a large data set. Project Scope: There is a need to develop an INTERACTIVE and EFFICIENT framework to serve as a decision support system for the evaluation of left turn phasing alternative based on intersection conditions. This framework will allow (1) an interactive evaluation of left turn phasing and ultimately recommend phasing mode by time-of-day (2) Traffic Management Center (TMC) data can be fed into the decision support system and intersections requiring attention/modification of left turn mode will be flagged. Project Scope: The University of Central Florida’s Department of Civil and Environmental Engineering in joint cooperation with the City of Orlando proposes to perform research on the Lynx Bus system involving Applications of Traffic Signal Priority Technology for Transit Service. This document explains details of this collaborative effort between the University of Central Florida and Florida International University on the proposed project titled “Performance Measurements of Transportation Systems based on Fine-Grained Data Collected by AVI and AVL Systems,” to be submitted by FIU to the Georgia Institute of Technology University Transportation Center (hence referred to as Georgia Tech UTC). This section deals with the second objective of the FIU and UCF proposal “Utilization of transit vehicle AVL data to estimate the performance measures of transit systems. 1. Due to the lack of available 110V power, the system could only be tested for a few hours at a time. For the same reason, very limited amount of data was collected. 2. Most freeway gantries do not have available power. The ones that do may have “switched” systems that only operate at night. Most of those do not run on 110V requiring costly transformers. Also wiring each gantry for 110V power is relatively expensive. 3. Power consumption of cameras was not a design issue as the assumption was that power is readily available and cameras require relatively low wattage. 4. The system used an expensive triggering device. Due to cost considerations, a single trigger was used for all lanes. This means that only one lane can be triggered at any given time. While this worked fine for Phase I, clearly this approach is limited in busy corridors where multiple trucks can be using several lanes simultaneously. 5. Relatively long time needed for system installation as wiring the system was time-consuming. In the proposed project, we propose to address these limitations and expand the field test to three gantries covering a total of 9 lanes (Gantry locations will be selected in consultation with FDOT). Data will be collected for a full year to account for seasonal changes, which will enable the research team to fully evaluate the approach on a large data set. Project Scope: Research on distracted driving has primarily focused on in-vehicle distractions including texting and cell phone use, “infotainment” navigation and audio systems, and other in-vehicle devices. Human factors engineering, which attempts to account for the capabilities and limitations of drivers, promises to provide ways to improve safety by designing more forgiving systems and environments. Successful human factors engineering requires a multi-disciplinary understanding of human perception, cognition, and the associated response factors. By understanding the driver’s perception of the environment, engineers can make informed design changes to operational environments (such as temporary work zone areas and approaches) and reduce the potential for driver confusion, thus improving safety for both workers and drivers. The central focus of our research is to identify changes in the visual search patterns of drivers as environments become more complex. Specifically, we look to evaluate driver’s responses patterns as they approach a temporary work zone area in which traffic flow has been altered from the ‘normal’ pattern. The results obtained from such study would allow engineering guidelines to be developed, improved and refined so that the use of traffic control devices can enhance the safe passage of vehicles through these proven dangerous locations. Project Scope: This project will develop an algorithm for Variable speed limits on freeways. Real-time crash models will be estimated and integrated with the variable speed limits algorithm. This system should be implemented as part of active traffic management strategy. Project Scope: This project presents a framework to incorporate safety and operation into the existing ATIS on expressway network in Orlando. The proposed framework is considered as a cost effective added value to the expressway authority. By implementing the proposed system, OOCEA would be recognized as a pioneer in proactive traffic management. OOCEA is already implementing innovative ITS solutions, e.g., queue detection and warning at the entrance to the I-4 interchange. Sponsored by the Colorado Department of Transportation. Project Scope: Develop a system to incorporate Variable Speed Limits based on advanced algorithms to improve traffic turbulence in real-time and therefore reduce crash risk and improve flow. Since traffic data for the freeway are collected continuously it is possible to develop models using historical incident data and apply them in real-time to examine the traffic data for detecting any incident that might have occurred on the freeway. Project Scope: Objectives of this project are: Objective 1: To establish the suitability of current traffic-related zoning approach in the new generation planning method: Transportation Safety Planning (TSP). Objective 2: To explore the effective and efficient use in TSP of existing key determinants in traditional transportation planning (TP) such as trip generation/distribution data. Objective 3: Based on the accomplishment of objectives 1 and 2, to develop a prototype of a scientific, while practical, spatial analysis toolbox to advance TSP practice at various levels.